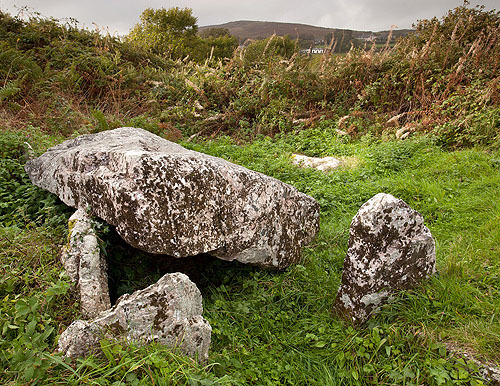 A Neolithic Burial Chamber located in overgrown sand dunes to the west of Three Cliffs Bay. The ruined structure is made of slabs of Limestone, Sandstone and Conglomerate , with an eastern entrance Passage, main chamber with a semi-collapsed Capstone, a well-preserved southern side chamber and a ruinous northern chamber. The main chamber is 4m long and 2m wide, with six uprights in their original positions . Location - As the Coast Path drops down the west side of Three Cliffs Bay a signpost indicates a path to Penmaen, about 150m along this path , a green track on the left leads to this well hidden / unsigned monument.